Hi! Guess what? The Lady Lilianatha has decided to pay a visit. She will tell us about the beautiful Umi Ryuzaki. Please be seated, she will come soon. Lilianatha: Konnichiwa minna! I am the Lady Lilianatha, guardian of the garden. I'm proud of my gardens and their caring tenders. Mia has worked very hard to make this shrine beautiful and I am sure you have all come to the shrine to learn about Miss Ryuzaki. Miss Ryuzaki, as shown above, is a extremely beautiful and graceful young woman. She comes from a rich and good family. Mia, would you care to talk a little about her? Mia: At first, I thought Umi was very snobbish. She came from a rich family and acted very arrogant. Umi is also very beautiful, graceful, and talented so that added to her arrogance. When the knights landed in Cephiro, she was the one who whined the most. She was also very impolite to Clef. In fact, when she went to Cephiro for the second time, she admitted that she was a being bitchy girl. Lilianatha: Our first impression of Miss Ryuzaki showed that she was a mean person. But later on, Miss Ryuzaki proved that she really is a kind hearted person when she protected her fellow knights with water magic. Mia: Yup. That's what I like about her. She's really protective of her friends and would follow them to hell if necessary. Lilianatha: Miss Ryuzaki also has a humorous streak. Her humor is considered a little strange, but it does lighten up the atmosphere. Mia: Like the time when the knights went to the spring to find materials for their armor. Umi twisted the spring's original name to wierder name because she thought the spring as eccentric. Lilianatha: She also did not like Mokana. I remember that she wanted to eat it. Of course, Mokana always remind her of marshmallows. Mia: I'm sure she can make Mokana into a wonderful dessert. Umi is such a wonderful cook when it comes to confectionaries. Lilianatha: Yes, I could see it now. Mokana would be the best-selling dessert in whole world. There would be Mokana flavored ice cream, Mokana shaped cakes, etc. Mia: It would be a instant success. Umi-chan would be richer than ever. Cephiro would be famous!! Mia: I do believe we have scared Mokana. Lilianatha: Don't worry, Mokana. We won't make you into dessert, you're to fluffy. Though you could be manufactured into a pillow, ne? Mia: What was that? I couldn't hear it. Lilianatha: Oh, it said "I'm outta here". Mia: I feel sorry for the poor little thing. It should know that we won't hurt it. Afterall, he is the *creator*. Lilianatha: True, but it has so much potential as ice cream. Mia: Let's talk about something else, ne? Lilianatha: Yes, we've been on the subject of the mokana dessert for too long. Let's see what's next on the list? Lilianatha: Huh? Where? Oh, you mean talk about Selece. Alright. Selece is the mashin of Miss Ryuzaki. It is one of the legendary mashins created by the MOKANA. (yes, the one and only fluffy marshmallow. 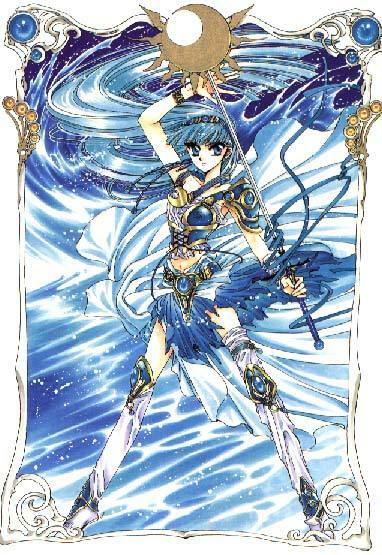 :)) Selece, along with Rayearth and Windam was created for one purpose. 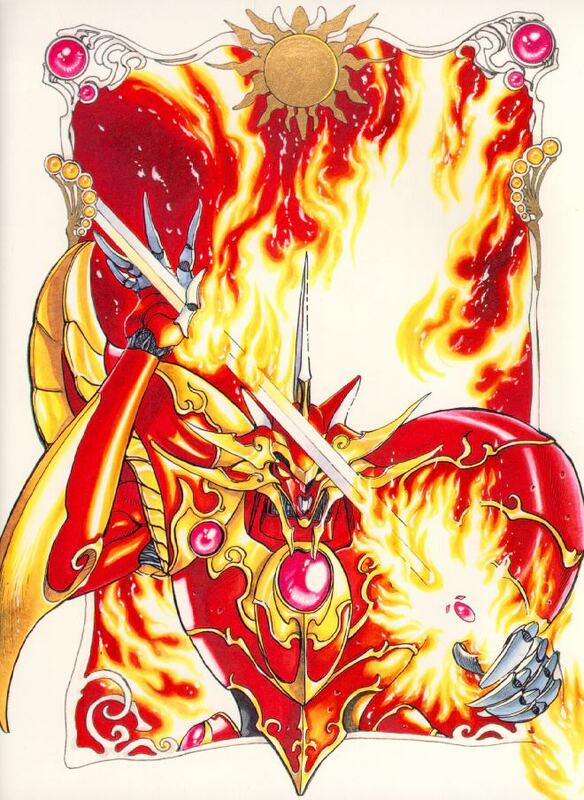 It was not to used as a weapon for Miss Ryuzaki, it was created to destroy the Pillar. Mia: That's really gruesome! But Umi doesn't learn this untill the end of her second trip to Cephiro. 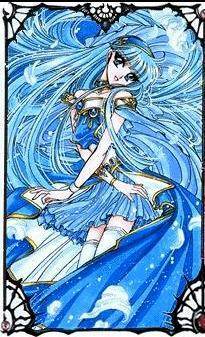 Lilianatha: Selece resides in the water shrine in the sparkling ocean of Cephiro. 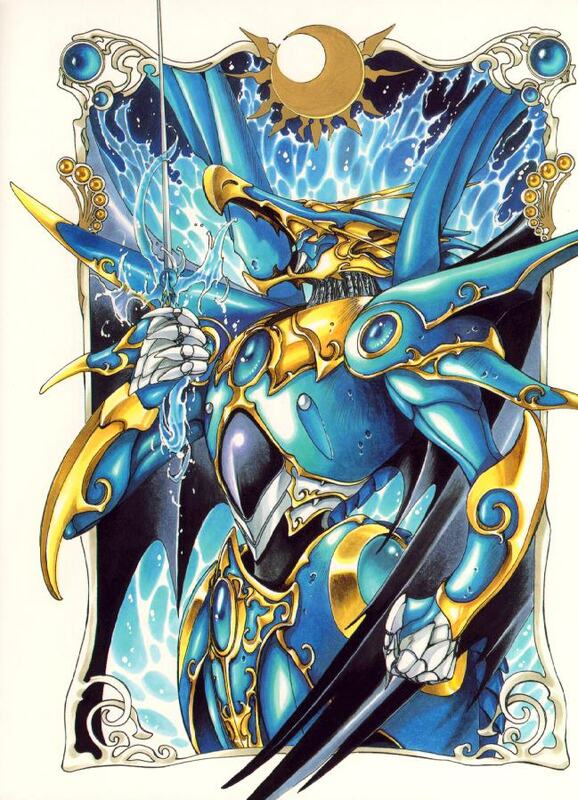 It was considered the water god* by Cephironians**. When Miss Ryuzaki was brought to the shrine she had to prove herself worthy of wearing Selece. She did that by defeating Ascot and his monsters. Mia: I remember she gave Ascot a fierce lecture on friendship. That caused Ascot to like her. He even grew taller so that he can impress Umi. Isn't that just so cute? Of course Umi never did realize why Ascot kept on blushing in her presence. After Umi got Ascot straight again, Selece became a dragon on her sword. Lilianatha: It also became stronger and more different than the first version. Mia: Yeah. That's because it is made of the legendary material, Eskudo! And crafted by best, Pharle Presea! The sword evolves with the bearer. As the bearer grew ever stronger and more intelligient in its usage, the sword evolves to meet the bearer's new needs. Lilianatha: No one else can touch the sword either, only Miss Ryuzaki. 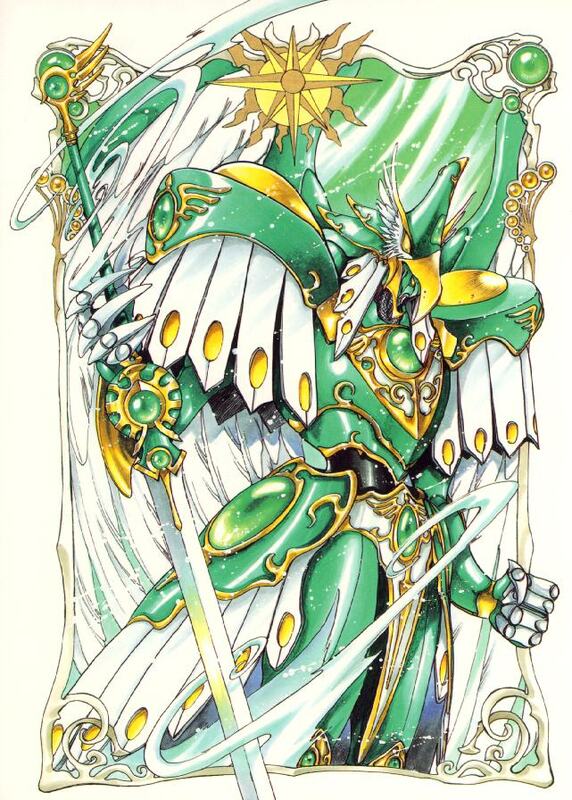 Presea: What else can be expected by a sword crafted by me, Supreme Pharle of all Cephiro!!!!!! Lilianatha: Presea, what are you doing here? Ah well, you may prove to be some good. Ok, describe Umi Ryuzaki. Presea: Hey, that's not fair. I'm just here to find out where that little rascal Mokana is!! Mia: We'll tell you after you tell us your opinion. Presea: Fine. I think Umi is a very strong person. She is willing sacrifice her life for what her loved ones and beloved places, like Cephiro. She also has a loud voice and hot temper. You'd think she'd be even and calm with water magic, ne? But anyway, I like her because 1)she's willing to defend what she thinks is right to death, 2)she protected Cephiro from invasion and lastly she share my annoyance at MOKANA!! HAHAHAHAH!!!!!!! Mia: Ok, thanks. Mokana went that way. Mia: I wonder what Mokana did this time? You would think the creator would be a sensible and polite creature. Mia: Yeah! C'mon. Let's get to it before Eagle get there. You know he's opinion towards sweets. Lilianatha: And he never has a cavity! What kind toothpaste does he use?! Boring! Get me out of here! Are you feeling charitable? Donate some valuables or cash to me!! Moyra's got really good background sets. This one is one of many.